Exquisite little freeform A-Grade Clear Quartz point, with Chlorite inclusions which form a partial phantom. This is a stunning quality formation also has a beautiful, large, light-bearing rainbow. 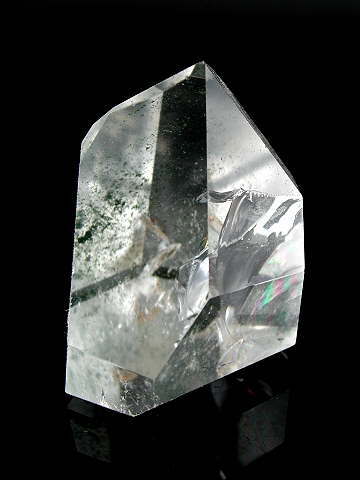 Chlorite is considered one of the Master healing crystals. Its powerful benefits include environment and personal energy field clearing and if used in combination with Amethyst it can help remove energy implants from the aura. You can also place a piece of Ruby and Carnelian with it to ward against psychic attack (this combination also assists earth bound spirits to move on to the light). Chlorite works at a cellular level to remove toxins and is believed to help in the absorbtion of certain vitimins and minerals like iron and magnesium. Clear Quartz is one of the most abundant crystals on the plant. It is not only found worldwide but occurs naturally in many different shapes and forms. The macroscopic (large crystal) types of Quartz have six principle properties. They can structure, store, amplify, focus, transmit and transform energy on every level. This is reflected in some of the different formations found such as channeller crystals, transformation crystals, double terminated crystals, laser crystals and so on, Clear Quartz, however, is the only truly ‘programmable’ crystal known to man. This means that you can get a piece of Clear Quartz to ‘take on’ the attributes of virtually any other crystal. You can also programme and dedicate pieces for chosen healing missions. It is superb for cleansing, activating and charging all Chakras, and can be used to draw out pain from the physical body. It is a crystal healing essential, often accounting for the major part of any crystal healing grid or layout. The clearer the piece, the more masculine (Yang) energy it has. This type also tends to have stronger, faster acting energy. The milkier specimens are more feminine (Yin) in energy and are better suited to long-term or chronic conditions. This piece has beautiful clarity.